THE Defence Headquarters, Friday, declared that it does not know the whereabouts of leader of the Indigenous People of Biafra, IPOB, Nnamdi Kanu. This came as it asked citizens not to panic over hitherto October 1st deadline given the Ibos by a group of Northern youths to vacate the region, saying the threat was no longer effective. 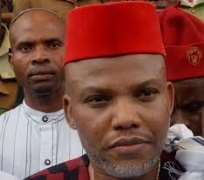 The DHQ which said contrary to some reports,it did not raid the IPOB leader's home, said it was not the place of the military to declare Kanu wanted. The DHQ equally explained that it was constrained to move a special military operations against the dreaded herdsmen because they were neither visible nor carry out their activities under an open or known group. Director of Defence Information, Major General John Enenche, who addressed the media at the Defence Headquarters, denied that Nnamdi Kanu was in military custody. Enenche also said contrary to reports in some quarters, the military did not proscribe IPOB, just as he said due process was followed in the group's proscription. “The military did not proscribe IPOB. Due process was followed to proscribe it. The job of the military was to diagnose security issues and warned the public of consequences and that is part of our media operations. “We did our media operations very well, otherwise that weekend would have been the longest weekend in this country and we are also very careful choosing our words and we know the law very well, “he added. He also denied that the military troops on Operation Python Dance raided Kanu's home. I think I later confirmed that there was nothing to actually justify them legally to mount roadblocks. I saw the militancy, nobody told me and I saw the action there. We are still investigating.” He spoke on the post military operations in the South East thus:”For the past couple of days since the operation started, the feedback I have been getting from that place is that yes, they are happy. Enenche said the country was not militarized contrary to the position of some people. “Other countries passed through this, if you go into history, before getting to where they are as developed countries today. “Like in China, you see one policeman inside a car, you hardly see a military man outside and it depends on the developmental process and what you passed through. “That's why in simple terms, I will tell you that we are not alarmed at all. “For example, the last terrorist attack in the UK, 24 hours after the attack, the government asked the military to take over the area. ” If the UK government can tell the military to take over, to back up the Police, I think we are just about 100 years old of amalgamation and we about 57 years old, it's not out of place, “he stressed. He expressed disappointment over the position of some legal practitioners on military involvement in the IPOD issue just as h said some of them got it right in his assessment of various contributions to the issue. “Of course, there will be conflicting demands on who is to do what by the military, the executive, the legislature they are all arms of the government and they all have responsibilities,”he said. “The statement that came through me is not at par at all with what the Chief of Army Staff came out to clarify. People had mindset and they were In a hurry to attack the military because of their mindset and because of that it is a pity to say that somehow some people lost their reputation,”he clarified. He said the various operations and exercises under the Defence Headquarters were being sustained in the North East, North West, North Central, South West, South South and South Eastern parts of Nigeria. It also reaffirmed “total subordination of the Nigerian Military to constituted civil authorities,complete dedication of the military to its constitutional roles as well as dedication of the Armed Forces of Nigeria to the protection of lives and property of all peace loving people where ever they live in Nigeria.